Dozens of activists protested outside of Harvard’s Arthur M. Sackler Museum on Friday, urging the University to remove the late medicine marketer’s name from campus and refuse future donations from the Sackler family. Wielding posters displaying photos of family members and friends lost to opioid overdoses, the protesters criticized institutions bearing the Sacklers’ name for being complicit in the opioid epidemic. Since the 1990s, more than 200,000 Americans have died of opioid abuse. “It’s the right thing to do,” said Mary Peckham, a Halifax, Mass. resident who held a sign at Friday’s rally with photos of her late son, Matthew, a victim of the opioid crisis. While some members of the Sackler family still serve as executives at Purdue Pharma, which manufacturers the addictive painkiller OxyContin, Arthur Sackler died in 1987, nearly a decade before the drug came to market. Many activists, though, hold him responsible for developing the aggressive marketing techniques that Purdue’s sales team would later use to distribute its product to pharmacies and doctors across the country. 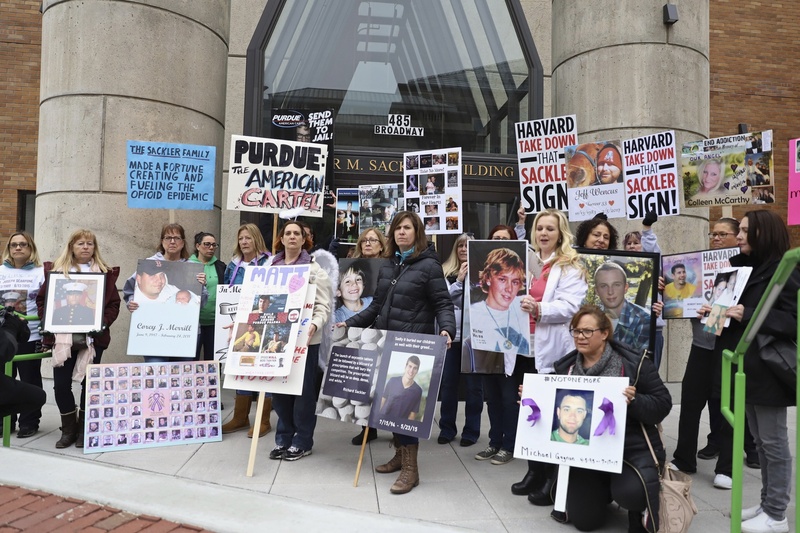 Massachusetts-based opioid grief groups organized the protest, which was the latest effort in a months-long campaign pressuring Harvard to remove the Sackler name from its campus. More than 14,700 people signed an online petition calling for the removal of the Sackler name, and dozens of mothers of opioid victims sent letters to University President Lawrence S. Bacow in March with that objective. In June 2018, activists held a protest inside the museum. Bacow responded to the mothers in March, writing that their letters “deeply moved” him, but that the University “does not have plans” to remove Arthur Sackler’s name. Activists said recent developments have given them newfound momentum. Multiple attorneys general have recently brought lawsuits against Purdue, revealing the company’s tactics used to push its dangerous painkiller, even after its executives knew of the drug’s potential for abuse. The company now faces more than 1,600 lawsuits in state and federal court and is considering filing for bankruptcy. In late March, Purdue and members of the Sackler family agreed to pay $270 million to settle an Oklahoma lawsuit, and other suits — including one in Massachusetts — could be fought out in court. Just days before the Oklahoma settlement, Tate Galleries — which runs multiple prominent art museums in England — said it would refuse any future financial donations from the Sackler family. The Smithsonian, which has an art gallery named after Arthur Sackler, has so far resisted calls to remove his name. “Shame on you — every single one of you — for not having a conscience,” Cheryl Juaire, founder of grief group Team Sharing Massachusetts, shouted into a megaphone at Friday’s rally, referring to Harvard and other institutions that have not yielded to protesters’ demands. A spokeswoman for Jillian Sackler, widow of Arthur Sackler, did not respond to a request for comment. Jillian Sackler addressed the recent calls to remove her husband’s name from institutions around the world in an op-ed published Thursday in the Washington Post, writing that protesters are engaging in “guilt by association.” She said none of the lawsuits filed against Purdue or specific members of the Sackler family name “Arthur or his heirs” as defendants. Harvard spokesperson Christopher M. Hennessy declined to comment on the activists’ most recent calls for the University to remove Arthur Sackler’s name from the museum.